One of many solid (yet cloudy) views. 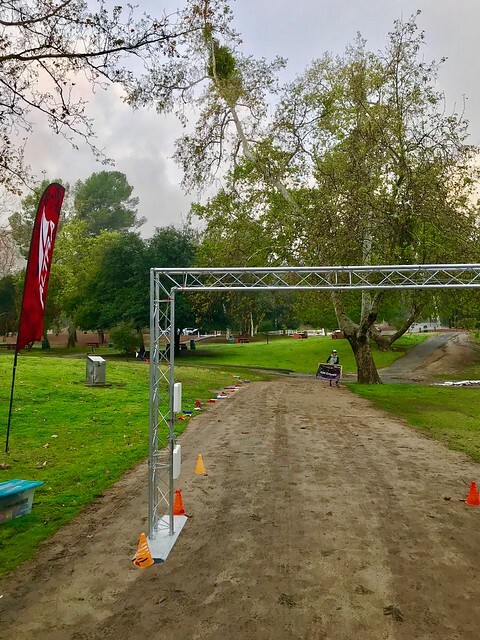 When I registered for the Griffith Park Half Marathon in LA, I had visions of blue skies, sunshine, and 70 degree temperatures. After all, that had been the forecast for the previous week or two and I couldn’t wait to get out there. What I wasn’t expecting was weather straight out the PNW – cloudy skies, rain, and a 54 degree morning. In fact, the news the night before called it the worst storm of the winter season so far. However, this event was super memorable nonetheless. I had been in downtown LA for work and was happy I was going to have time to race outside at the end of a long week of treadmill miles. Griffith Park (home to the famed Griffith Park Observatory and along the same trail system as the Hollywood sign) was at least a 20 minute drive from my hotel, and I started the morning a little nervous as I had to make sure I had everything packed for before, during, and after the race – considering that Lyft was my only form of transportation. Essentially, there was no going back if I forgot something important. In very non-Matt fashion, I actually did an admirable job and didn’t forget anything. Shocker. I lucked out that the race started in mildly chilly, but otherwise dry, conditions. That meant I didn’t have to hover under a tree while everyone else sought refuge in their cars. I watched the marathoners hit the trails at 7am and, following some great instructions about trail markings from Keira (the RD), we took to the hills a half hour later. The first stretch involved running up on some paved roads through the old LA Zoo, before giving way to some singletrack trails. Even within these first couple miles or so, there were some really solid climbs – a foreboding of things to come. There were also some downhills in there that were welcoming, but I knew I would eventually have to run (or walk) back up them later in the race. Even though the view wasn’t as nice as it could have been, around mile 2-3, we did have some beginning views of LA in the distance, with threatening clouds overhead. 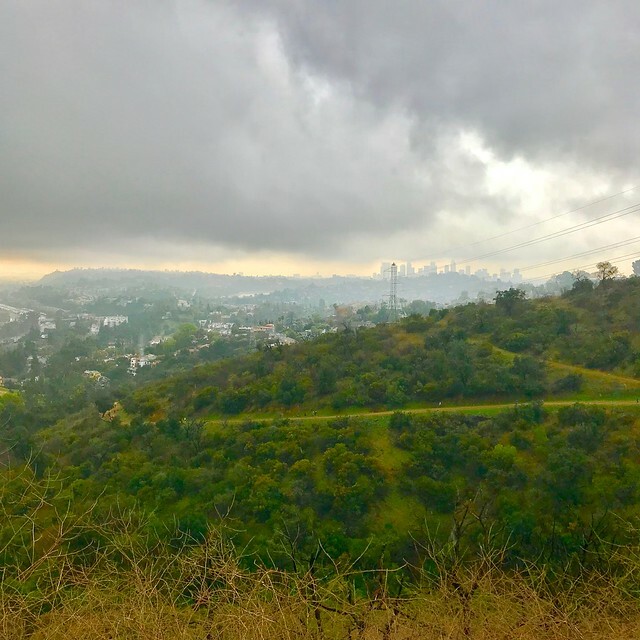 We were told that Griffith Park trails were better able to hold water than others in the area, even though it had rained the majority of the day prior. I was skeptical, but would have to agree with this. Although there were some wet and muddy spots, overall the terrain was really solid throughout the race. It could have been a lot worse, especially with the amount of climbing that was going on. The elevation gain actually reminded me of my race in Colorado last summer – where there were more than a few “WTF moments” where I would seemingly pinnacle a section, only to see runners in the distance on trails that were much higher than I was. In fact, there was a total of 1000 feet of elevation gain over the first half, and a total of 3200+ feet of gain and loss over the entire course – though it even felt like more. Around mile 5.5, we entered some relatively thick fog as we climbed, giving the trails a very eerie feeling and making the drop offs on the side of the trail more ominous. There ended up being nothing to worry about, and though the view at the half turnaround point provided no panoramas of the city below (let alone even about 100 meters of visibility), it was obvious that this reaching this point was a sense of accomplishment. The jaunt back to the finish really showcased just how much we had climbed. I didn’t realize how great the incline on the way out had been until I was cruising continually downwards for a few miles on end. Those downhills that I had enjoyed near the beginning of the race did come back to bite me as they turns to uphills on the way back. Though I did walk some super steep sections throughout the day, these ones really hit me hard and had me slowly hiking for distances longer than I had hoped to. 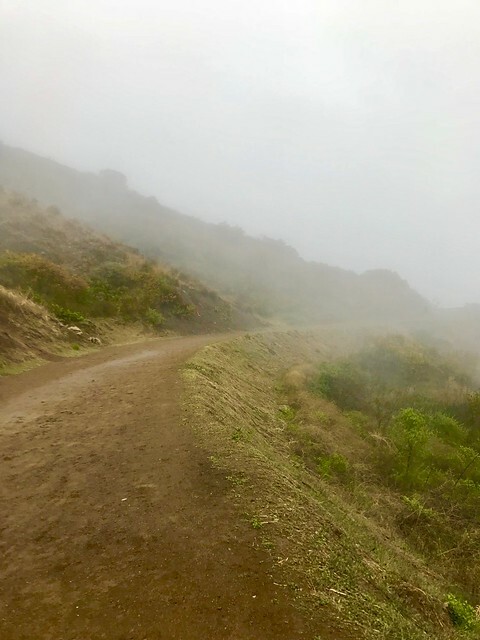 To make things even more difficult, the rain (which had actually held off so far) came on quick and hard – soaking me to the core and making the trails less stable then they had been. My final push to the finish was a bit more labored than I would have cared for, but I very rarely felt like I “earned” a medal as much as I did with this race. Afterwards, I received a race pint glass, sweet cotton blend tee, and took advantage of salty snacks that were available. Luckily, the rain actually diminished shortly after I finished (go figure) and hanging out to recuperate and watch other runners finish was actually pleasant. Overall, this race was fantastic despite less than ideal conditions. It whetted my whistle to come back and try Griffith Park in the sunshine. The aid stations were spaced at perfect distances from each other, and it seemed that every time I ran out of water in my small handheld, an aid station was less than a half mile away. In addition, each was super well stocked with electrolytes and snacks – though I left those for the marathoners and ultra runners to refuel with. Keira, an trail runner herself, really appears to know how to put on great races – for veterans, as well as novices. She directs 5-6 races each year, so make sure to check them out if you are in LA or want to take a little “runcation”. Run Oregon recommended.